After our wonderful brunch at Perilla Sunday we walked around the block to our favorite beer bar- The Blind Tiger. As usual they had a bunch of beers we’ve never tried before- the first of which was Brooklyn Brewery’s newest release the Cookie Jar Porter. 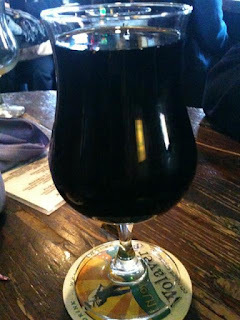 This beer is insanely dark in color, almost black and pours with no head at all. The smell was strong like toffee and cider. At first I tasted a mix of Kaluha and coffee but then it mellowed out on the end and was almost chewy with a hint of raisins and chocolate. Once again Brooklyn Brewery has created something completely original and very tasty. I don’t think I could drink more than one of these beers since it’s quite sweet but I’d love to pair it with some Snicker Doodles or Oatmeal Cookies for dessert. 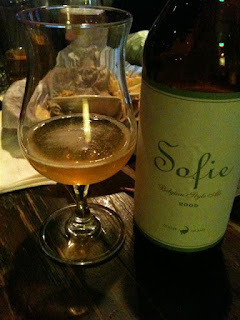 Another stand out beer we enjoyed that afternoon was a bottle of Sophie from Goose Island. Goose Island has long been one of my favorite breweries and this beer was delightful. It poured a light gold with a pretty thick head that slowly dissipated. It had a strong citrus smell on the nose and a light sparkling feel on the mouth. The first sip just reminded me of summer. It was light and crisp with a hint of citrus on the nose and a smooth finish of vanilla. Apparently this is one of Goose Island’s wine barrel beers. It’s a blend of 80% fresh beer and 20% that’s been aged in wine barrels and fermented with wild yeast. This is an unbelievably easy beer to drink. We all agreed this will be our new summer beer. I believe it’s only a limited release right now- hopefully it will still be around when the temperatures rise.